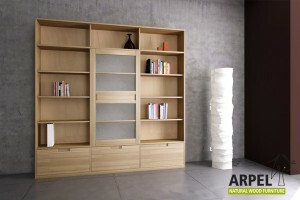 Discover our Quadro Bookshelves in natural solid beechwood. Extremely functional and versatile, they can be personalized in many different colors, coverings and dimensions, standard and custom. 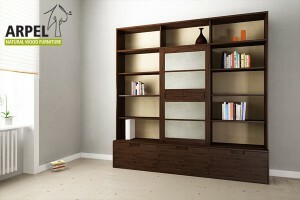 The Quadro Plus Bookshelf with Fabric is particularly versatile. 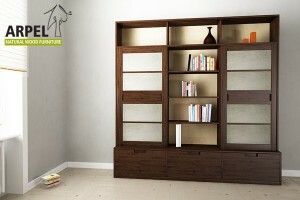 It is divided into 2 sections with sliding doors and 2 sections with drawers and shelves. With its clean and symmetric design it is perfectly suitable for any living ambience. The four multifunctional sections are also perfect to store kitchen utensils. 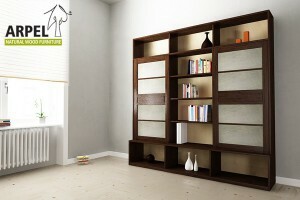 The Quadro Plus Bookshelf Rice Paper is particularly versatile. 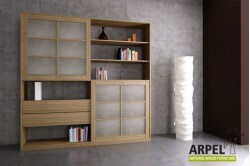 It is divided into 2 sections with sliding doors and 2 sections with drawers and shelves. With its clean and symmetric design it is perfectly suitable for any living ambience. The four multifunctional sections are also perfect to store kitchen utensils. 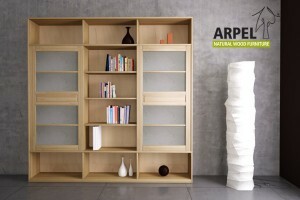 The Variant Basic Bookshelf made of solid beech wood is very elegant and multifunctional. 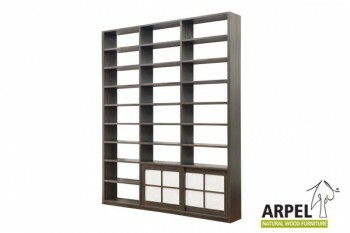 It adapts to any ambience and has numerous shelves where you can store books and all kinds of other objects. 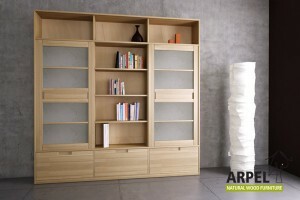 The Variant Basic Bookshelf 2 Sliding Doors made of solid beech wood with two rice paper sliding door is very elegant and versatile. It has two closed sections with sliding doors and an open section with shelves. Characteristic for this design that fits well in any ambience, is the wooden insert that gives the Shoji doors an elegant touch. Our Variant Plus Bookshelf made of solid beech wood distinguishes itself for its elegant, clean cut lines and versatility. 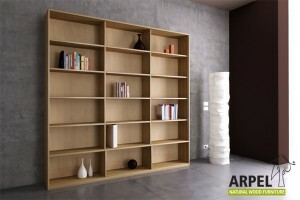 It adapts to any ambience and offers plenty of storage space for books and many other objects with its numerous shelves. Create your own personal model amongst our wide choice of sizes and other details. 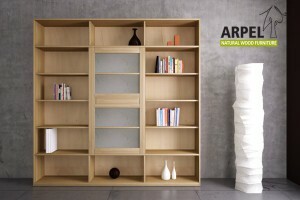 The Variant Plus Bookshelf made of solid beech wood in minimalist, japanese style offers a great space saving solution with much storage space. It has one closed section with a sliding door and an open section with shelves. Characteristic for this design that fits well in any ambience, is the wooden insert that gives the Shoji door an elegant touch. The Variant Plus Bookshelf 2 Sliding Doors made of solid beech wood with two rice paper sliding doors is very elegant and versatile. It has two sections closed with sliding doors and an open section with shelves. A particular touch that adds character to this minimal design is the horizontal wooden insert that runs along the centre of the Shoji doors.